We are a church of skeptics. Our religion is to doubt religion. We are a non-prophet organization. Keep learning. Accept scientific consensuses. Promote science and reason. We accept anyone into the church and you may worship another God besides Bacon. However, we support separation of church and state. Faith-based arguments from one group of people have no business in government decisions that affect all of the people. Religious organizations that pressure government to their worldview violate the basic rights of minority religions and non-religious people of the world. 3. Normalize Atheists & Religion. We oppose discrimination against nonbelievers and we oppose special privileges in the law for religious organizations. Religious people and their groups are not superior to the rest of us. Skeptics and atheists do not lack a moral compass. We are an important and growing minority and we deserve a normalized, respected place in families, communities, and public discourse. It’s not enough to notice discrimination. We need to speak up when it happens. We have fun. We mock our beliefs because they are no stranger than other beliefs. Unlike some religions, we don’t get tangled in unprovable supernatural interpretations of goodness that might be manipulated or misinterpreted to justify anything. Just be kind to people while respecting their boundaries. Like some religions teach, you should love your neighbor. That’s why we encourage giving to a list of recommended charities. Bacon is our god, but that’s just a term of endearment. We don’t believe that Bacon is actually spiritual, though smelling it is surely a Divine Experience. We also like donuts because they are Holey. In the beginning, there was the Big Bang, which begat all of time and space. Eventually, sacrificial pigs evolved and the God of Bacon came to be. 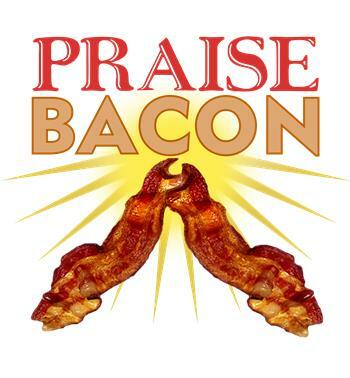 Praise Bacon! If you don’t like pigs, you may praise Vegetarian Bacon or Turkey Bacon. Or just love the smell. Bacon is not jealous. You may have other gods or no gods before Bacon. We are entirely different from those who worship the Flying Spaghetti Monster, for we prefer our pasta on top of our bacon, while they prefer their bacon on top of their pasta. But that’s cool. Again, we accept everyone who loves the smell of bacon. Also, bacon is real. The Great Mystery of Bacon is whether it is male or female. Bacon Prophet and Founder John Whiteside has listened closely to frying Bacon and has been unable to determine its gender from the sound of sizzle. He found that the more he turned up the heat, the more aggressive Bacon got. We do not need to understand all mysteries about Bacon to love the smell of Bacon. 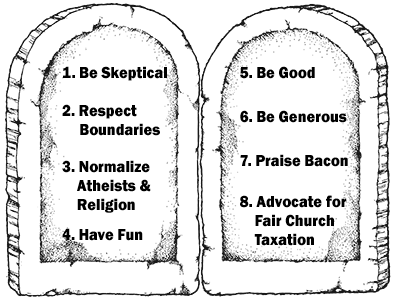 The United Church of Bacon pays taxes and we think other churches should too! We believe churches should be legally required to publish reports on income and expenditures, as secular 501(c)(3)s do, and should be taxed accordingly if guidelines are not followed. The religious privilege of not having to report how donations are spent is a gross oversight that allows for many violations of the separation of church and state. Recent figures estimate over $80 Billion in subsidies are provided to religious organizations each year. If taxed, these funds would provide enough revenue to feed and clothe every homeless person in the United States. By asking for legal privileges on behalf of a Bacon God, the United Church of Bacon illustrates how every church has strange beliefs and that’s no basis for bias in the law. Religious people are not superior to nonreligious people, and religious organizations do not deserve special legal privileges above secular non-profits. The United Church of Bacon aims to give a larger portion of its budget to good causes than any other church in the United States. Over 75% of our budget goes directly to charity (the remaining 25% is spent basically maintaining security and site management.) By matching other’s charity to organizations our actual contribution is over 100% charitable causes. Want to help? Pledge your donation to a nonprofit and ask for matching donations in the “Name of Bacon”. Contact us HERE for details. We need to take religions off their pedestal and give them the same treatment as secular non-profits.